All of the pollutants mentioned above can reduce the quality of the air you breathe, making your allergies more severe, and in some cases can cause respiratory health problems for the elderly and the young. 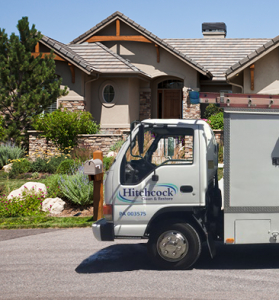 The air duct cleaning services we provide at Hitchcock Clean and Restore can help improve the air quality of your home or office. Our trained and skilled air duct cleaning professionals can rapidly and effectively remove any and all of the dust and debris that is occupying your ventilation system. Leaving your air ducts clear, clean and in better working order. The process we use is a forward and reverse skipper and power brushing. Our air duct cleaning services make a noticeable difference! Sick building syndrome (SBS) emerged as a health problem when building owners started to reduce ventilation in an effort to save on heating and cooling bills. An unintentional side effect was an accumulation of contaminants in high traffic areas indoors. This build-up affects the health of those who live or work in the building. SBS is a collection of symptoms such as burning eyes, nose, and throat. Sinusitis, dry skin, nausea, headaches, fatigue, and mental confusion are also SBS symptoms that are sometimes misdiagnosed. The EPA has tested Indoor Air Quality nationwide and reports it is up to 100 times more polluted than outdoor air. Fact: According to Total Health & Better Health Magazine 1 out of 6 individuals suffer from allergies because of the contact they have with fungi and bacteria in air duct systems. Fact: According to Louisiana Cooperative Extension Service clean systems reduce running time and restore capacity. This helps you save on monthly heating and cooling bills. Fact: Fiberglass filters are only 7% efficient when it comes to stopping dirt, pollen, and dust from passing through your system. Fact: Dust causes pneumonia, not the ‘cold’ and exposure. Fact: Asthmatics, the elderly and individuals with respiratory problems are more sensitive to pollutants in the air. Fact: Children breathe faster and inhale more air per unit of body weight than adults, making them more susceptible to airborne pollutants. Fact: Most individuals will spend 60%-90% of their lives indoors. Our professionals are standing by to help make your home or office a healthier living or working environment. Contact Hitchcock Clean and Restore today to schedule your air duct cleaning appointment! Berks County’s #1 Rated Choice For Air Duct Cleaning! !